Robert de Clifford was born in 1274, the only son of Roger de Clifford (1243-1282) and Isabel de Vipont (ca 1254-ca 1292). Throughout his lifetime Clifford saw active combat for the crown on many occasions. Aged only 22 years he accompanied King Edward I in 1296 at the capture of Berwick and at the battle of Dunbar, during which expedition Edward also confiscated the ‘Stone of Destiny’ which remained at Westminster Abbey until 1996. By 1297 he was appointed captain of the king’s castles in Cumberland from where he led several bloody and destructive raids into Annandale and Annan. Clifford fought at the Battle of Falkirk in 1298, at Caerlaverock in 1300 and was also at the siege of Stirling Castle in 1304. In 1307, he is recorded as pursuing Robert Bruce in Galloway. He was unable, however, to prevent James Douglas from capturing Douglas Castle and massacring the garrison that Clifford had placed within it. As might be expected of such a record he was rewarded handsomely, given positions of status and tenure of extensive lands. However he did not completely fall under the obedience of the crown. He was named as a conspirator in the murder of Piers Gaveston, only being pardoned just before Bannockburn in 1313. Robert married Maud de Clare daughter of Thomas de Clare and Juliane Fitz Maurice in 1295. 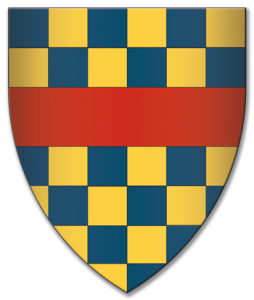 Robert and Maud had three children Roger (1300-1322), Robert (1305 -1344) from whom the baronial line descended, being elevated to the earldom of Cumberland by Henry VIII, and Idoine. The day before the battle of Bannockburn Robert led an English force around the east side of Stirling Castle but encountered Scottish forces led by Randolph. The English eventually scattered and Clifford’s withdrawal was regarded by one chronicler as a disgraceful rout. He was killed the following day charging into action at the English vanguard. He was a respected and much regarded knight by both the English and Scottish crowns. As such King Robert gave orders that his remains be treated respectfully and were released to King Edward without ransom. He is believed to have been buried at Shap Abbey.